Last fall Sharon Spence of Stitchjones asked me to design a shawlette with her Pai Mei Sock yarn in a variegated color for her 2014 Yarnageddon Club. She had a Hawaii theme in mind, and she knows how much I love Hawaii. I love variegated yarn, but I love it even more when it’s combined with a semi-solid. We settled on these colors, which I got to name: Rainbow Shave Ice and Warm Sand. Perfect! Aloha can mean hello, goodbye, or just be a friendly greeting in general. The Aloha shawlette looks good coming and going! It features rainbows, leis, and waves. Knitting begins at the center back neck (note the three lacy flowers here), continues through the rainbows and shellflower leis, and ends with an edging that is knit onto the live stitches at the end. The shawlette uses 2 half skeins of Pai Mei Sock. The yarn is available from Stitchjones. The shawlette is a nice size both on the shoulders and worn bandanna style, but the result made me so happy, I had to have a full size shawl, too. More rainbow, more happy! 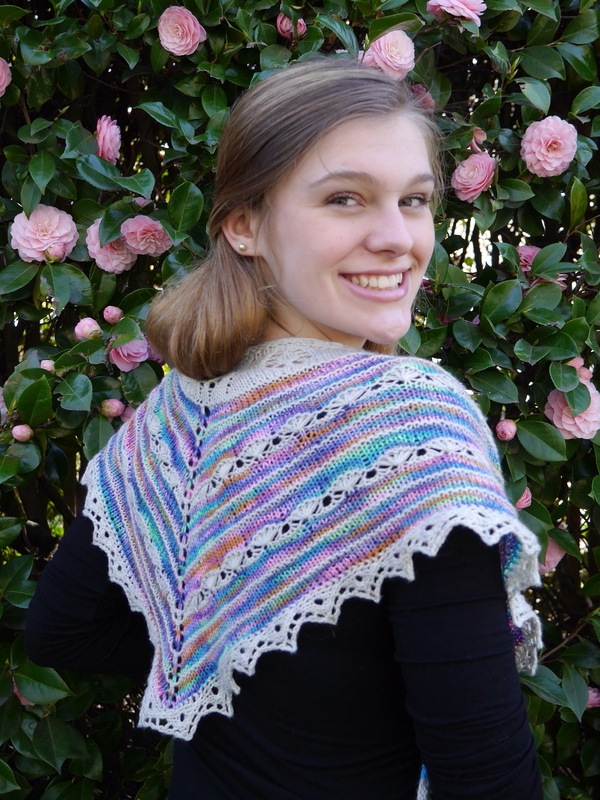 The pattern includes instructions for both the shawlette and shawl. 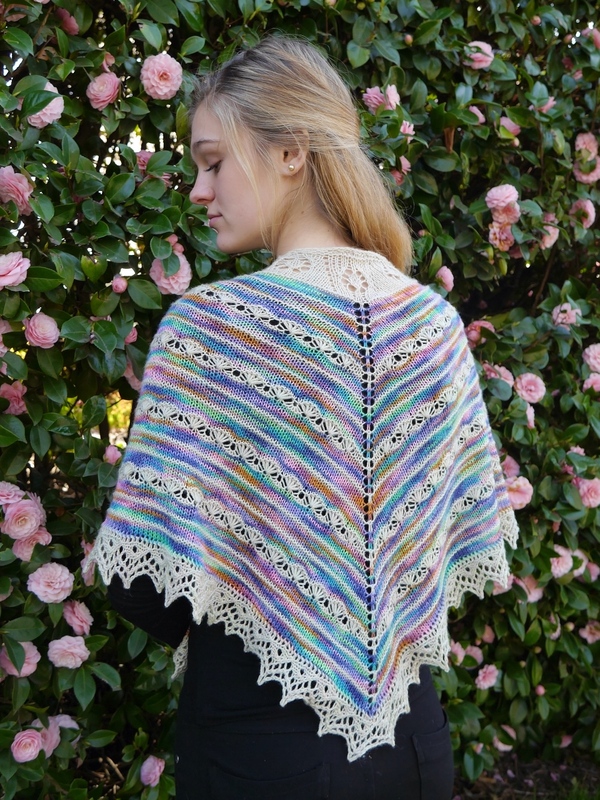 It is available through my Ravelry page, and will be on sale for 33% off the usual price through April 7. 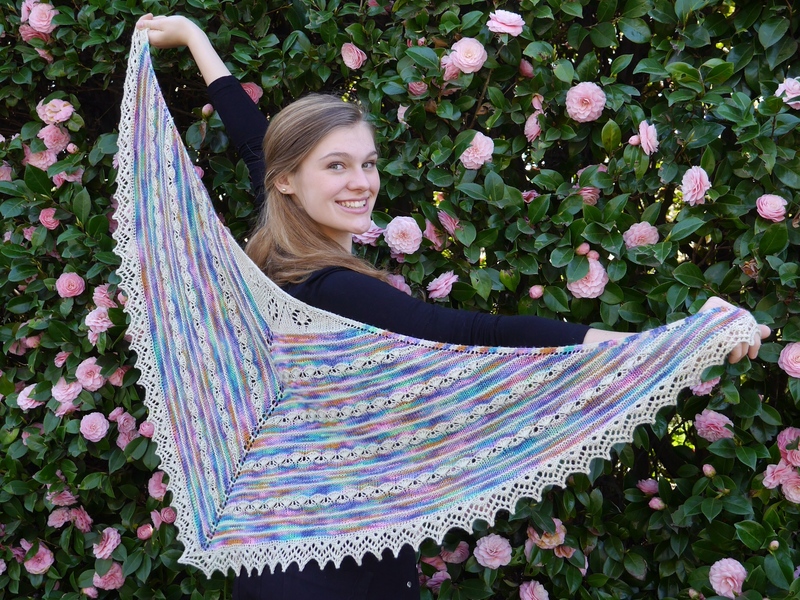 Visit the Aloha Shawlette/Shawl pattern page and use the coupon code ALOHA to make your purchase. I hope you like it as much as I do! 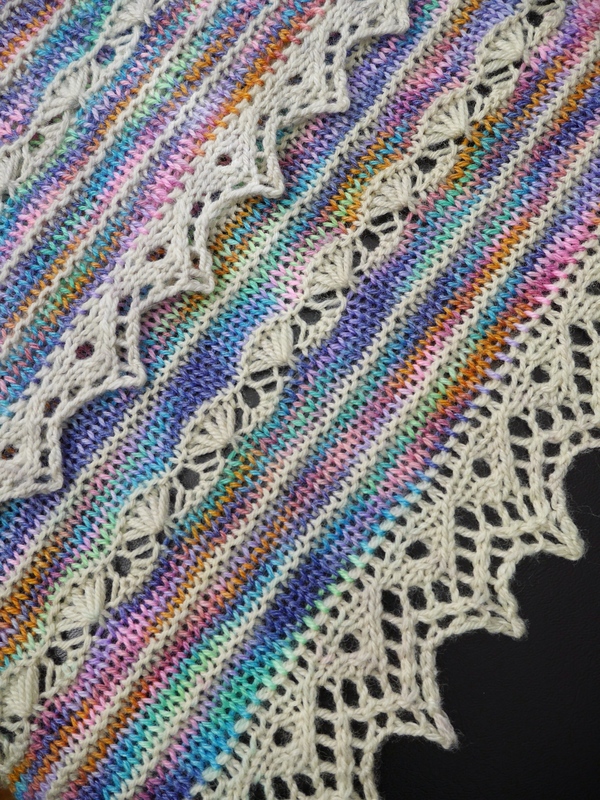 This entry was posted in Knit, pattern design, yarn and tagged Aloha shawl, Aloha Shawlette, Stitchjones, Yarnageddon. Bookmark the permalink. I love how the cream tones down the crazy colors and makes it totally wearable! This is beautiful!! Thank you! I think variegated yarn really needs some thought on how to make it shine. I’m really happy with this arrangement. 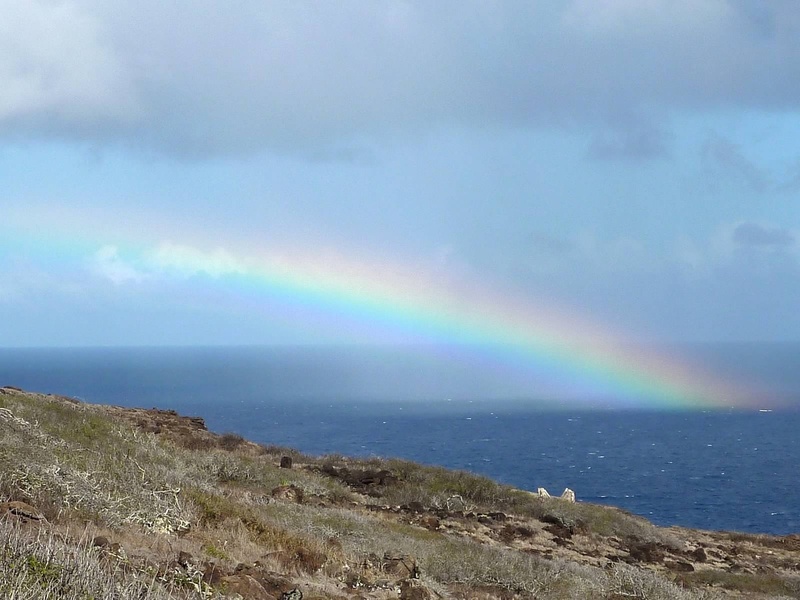 The warm sand definitely brings down the rainbow, but not so much that the rainbow gets squashed! Tried several different times..very pretty!Would love to make it!! Wow! Very pretty. Love the picture of it worn wrapped in front. I do, too! The little flower lace inset almost looks like a collar. You’ve designed another stunner! Just beautiful. Absolutely love this. 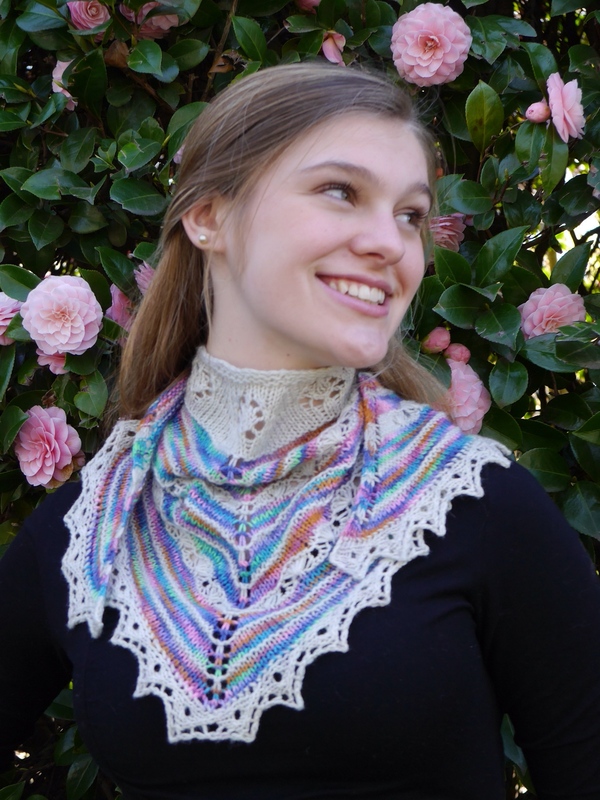 I just ordered the pattern and the yarn — it’s going to my birthday present from me to me! I’d love to do it with a stormy gray instead of the sand color.